Catedral De Sevilla,The climb really is worth it.. Welcome to the final part of my food and travel adventure in the beautiful Andalucian city, Seville. Looking out of the window of my London apartment ( rain, rain, rain), I cant help but miss the hot, sunny Seville weather. A few hours were spent on the terrace of our lovely hotel drinking white wine while eating delectables bought from Mercado De Triana, a market built on the site of an ancient castle. I really recommend this market, you will spot all the locals buying their cakes, cheese,seafood and fruits. Its also a great place to grab some fresh Paella, Churros and a ‘la caña’ (a small glass of ice coldbeer). A nice walk along the Triana bridge lead me to a restaurant called Uno de Delicias. The restaurant is ranked 14th out of the 1,459 restaurants reviewed on Trip advisor. This restaurant deserves a higher rank in my opinion. On arrival, customer service is excellent, like most tapas restaurants, they have all their specialities up on chalk boards for easy viewing. Along with a personal menu you are also given an iPad mini where you can view a virtual menu with pictures and descriptions, which made it really easy for an amateur such as myself. I tried a few tapas dishes in their nice sunny outdoor seating. This dish was spot on, something so basic, yet so fulfilling. This dish had baked and lightly fried spiced wedges accompanied by the usual tangy tomato sauce unashamedly creamy garlicky Aioli. Possibly the best have had in a long while. A well thought out combination of Brie, onions and pork on toasted bread. If you love Brie and caramelized onions like I do, then this dish is actually a delight on a sunny day especially when washed down with the local cold beer. Mini juicy hamburgers on slices of fried potato and creamy sauce. All in all, a good dish. This dish was quite colourful and rich. The minced garlic, basil and wild rice combined with the tender squid, onion and sherry reduction was just the sought of light and fresh dish one needs on a hot summers day. Just a little side note, the rice is served cold, while the squid is served hot. Its a bizarre concept but it seems to work very well. Makele translation: juicy beef steak. The meat in this case was medium rare (you are asked on preference), sliced into thin rectangles and covered with lightly rock salt. The potatoes were nice and crisp. I really recommend this dish. The meat was very good indeed. La Azotea – We visited this restaurant right next to the cathedral based on tourist recommendations during our walking tour and it has to be said that the Tapas we tasted was exceptional. I shouldn’t have been surprised considering the restaurant was ranked 7th out of 1,459 on Tripadvisor. I only wished I spent more time at this restaurant. This dish was one of the best Tapas I had in Seville. 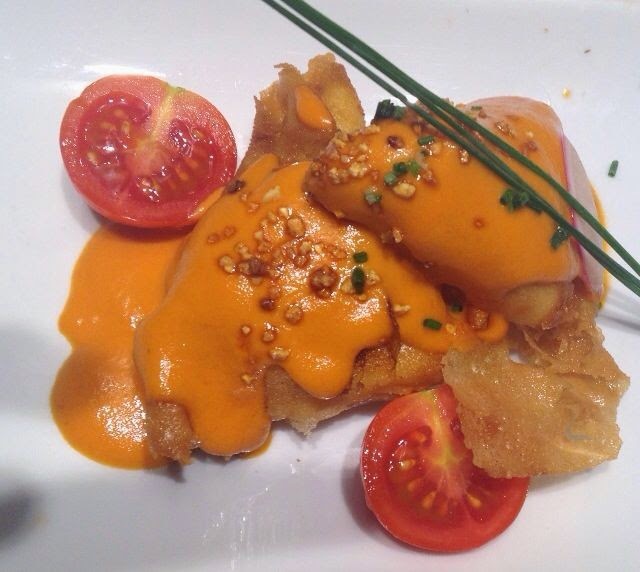 Perfectly warm cheese with delicious Marinara sauce encased in rice filo pastry. A 5 star dish in my opinion if ever there was one. Still drooling. La Pepona– ranked 13th out of 1,459 on Tripadvisor, this restaurant was very impressive. I have to admit, I have no recollection of what the first dish was called ( was too busy enjoying the food). Drop names in the comment section if you can remember what first tasty Tapas picture was called. I would definitely recommend La pepona. I needed a bit more time to try out all the various dishes on the menu. There goes the end of my food adventure in the wonderful Seville. I hope you enjoyed it and if you plan on travelling to Seville, do visit those restaurants. There were many places to eat in Seville and i just wished i could it at every one of them. Will leave you with a few more pictures and sign out.